27th July 2013 saw the successful launch of IBLI in Isiolo. APA Insurance, World Vision Kenya and the International Livestock Research Institute (ILRI) have come together in a dedicated effort aimed at mitigating the effects of drought experienced by pastoralist communities in Isiolo as the two introduce an index-based insurance product using satellite-based data on forage availability to provide insurance cover against the loss of livestock as a result of drought. The development is a shot in the arm for communities around the region whose socio economic activities are characterized by nomadic lifestyle with livestock being a major source of wealth in an arid – semi arid area that experiences two rainy seasons at an average of 300 – 600mm annually. Speaking during the launch ceremony, Apollo Group CEO Ashok Shah noted the challenges that have constantly faced the arid and semi – arid communities key among them being drought that results to the loss of cattle due to inadequate forage while highlighting the contribution that the satellite technology and insurance cover will provide in ensuring the community’s livelihoods are not adversely affected. “Over the years, cases of drought have continued being reported and its negative impact has resulted to loss of livestock. This technology will enable us observe vegetation cover while proving an objective trigger for the insurance payout. The insurance package will be based on models developed by ILRI establishing a statistical relationship between area average livestock mortality and forage availability,” said Shah. 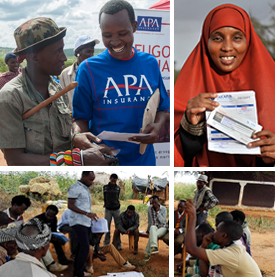 APA Insurance, a member of The Apollo Group continues to further explore insurance for the under-served people a move that was sealed from the Kshs 1.15B strategic partnership with Leapfrog Investments – a leading investment fund that invests in financial services largely in companies that provide insurance in Africa and Asia. The introduction of the cover in Isiolo is a follow up of a similar product that APA, supported by ILRI, successfully rolled out in Marsabit last year, the extension of the same to Isiolo an area with similar agro-ecological characteristics stamps the insurance company’s commitment towards the provision of insurance cover to underserved communities. “It is exciting to witness this significant milestone representing the scale-up of the index-based livestock insurance program. Having initially began in Marsabit, the rollout of livestock mortality cover for pastoralists to Isiolo and beyond is a product of considerable effort by a consortium of researchers, development partners, government agencies and commercial players. Here in Isiolo we applaud the commitment of APA Insurance and World Vision International to offer this service to the community. An estimated two thirds of the land area in Kenya is semi-arid to arid characterized by low, unreliable and poorly distributed rainfall. With these areas being used for pastoral farming and livestock contributing about 26% of the total national agricultural production, livestock insurance will be a welcome break to the loss that has been experienced in the past as pastoralists will have the ability to protect their investment.